Whenever I travel to a new city, the first thing I want to do is find a good vantage point; somewhere high up, with commanding views, where I can get a visual grip on my new surroundings. The next thing I want to do is celebrate: rooftop cocktails combine the two. 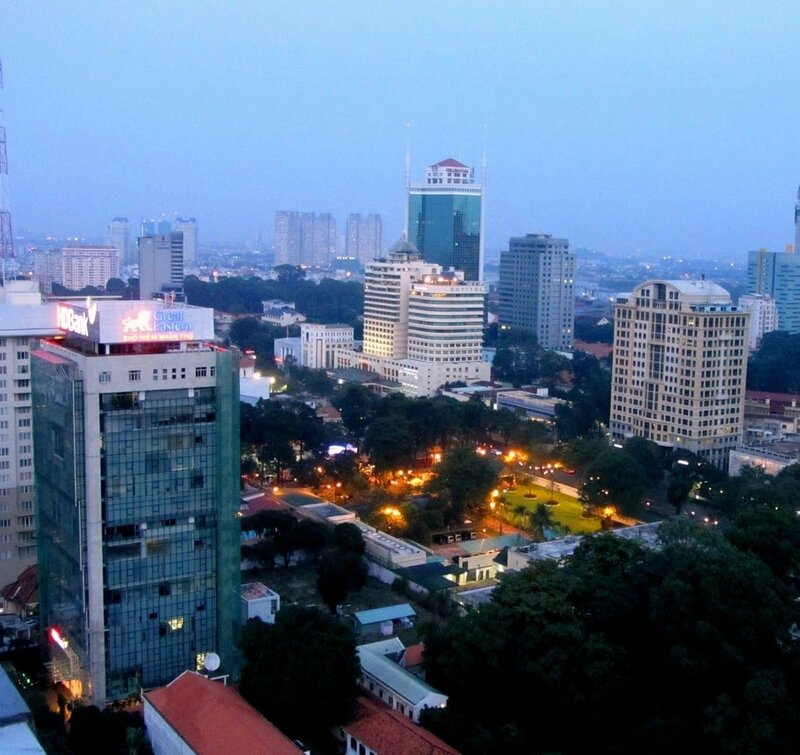 When I first arrived in Saigon – seven years ago this month – I did exactly that. 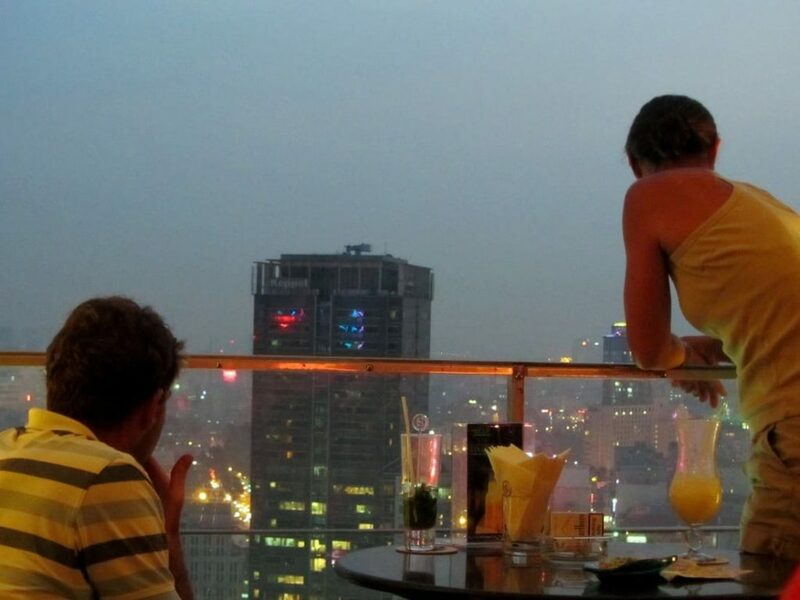 For a while, rooftop cocktails became a regular fixture among my friends – none of us could have afforded this luxury in our home countries! 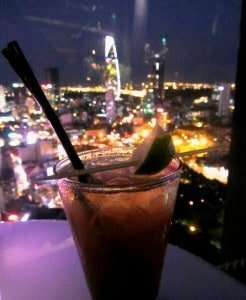 To celebrate the 7th anniversary of my first drink with a view in Vietnam, here’s my Top 5 Rooftop Cocktails in Saigon. Saigon is at the heart of Vietnam’s economic boom: new high-rises and five-star hotels go up every year. On the upper storeys of these buildings there are stylish bars with views over the city, catering to the country’s nouveau-riche and wealthy foreign visitors. 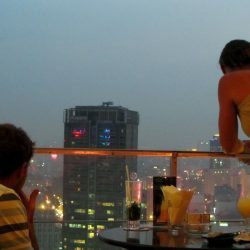 But, with the price of drinks still relatively low, rooftop cocktails are affordable for travellers on all budgets, especially if you make the most of Happy Hours. And, it’s not only the new monoliths that offer a drink with a view: colonial hotels, dating back to the days when Vietnam was part of French Indochina, still mix cocktails behind the same bars that served the likes of Graham Greene, and a whole host of famous journalists and photographers during the years of the ‘American War’ (as the ‘Vietnam War’ is referred to here). VIEW: All cities, even Saigon, look orderly from above: at street level Saigon is chaotic and polluted, but from rooftop bars you can make out the long, tree-lined boulevards that divide the city into neat quarters, and the sweep of the Saigon River meandering towards the East Sea (South China Sea). For me, a good view more than makes up for any other faults a bar might have. 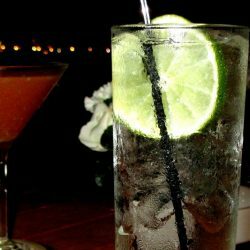 HAPPY HOUR: When you’re spending between $5 and $10 a drink, times and conditions of Happy Hour determine value for money. Buy-one, get-one-free is a good deal; marginally discounted drinks during off-peak times – when most people wouldn’t dream of an alcoholic beverage – is not. 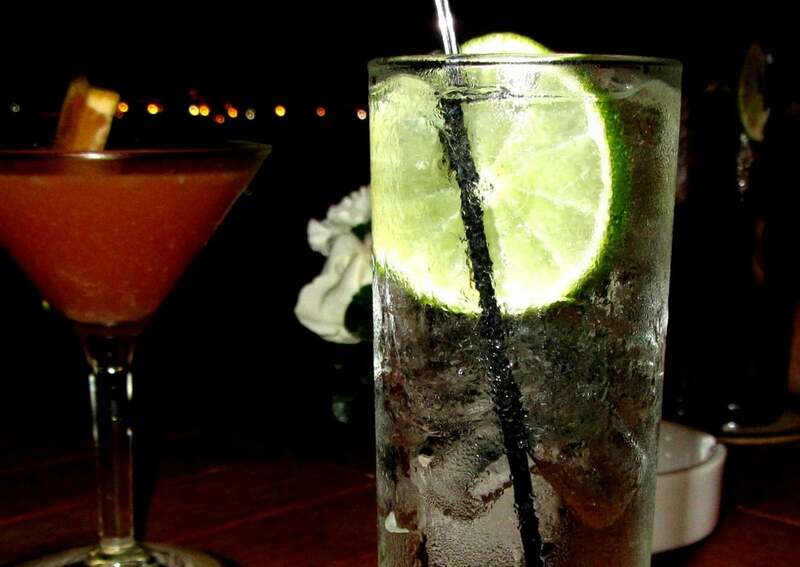 COCKTAILS: Is there more ice than alcohol in your glass? Or has the barman been so liberal with the spirits that you feel he must have confused the gin bottle for the soda bottle? Quality, strength and quantity vary considerably from bar to bar. 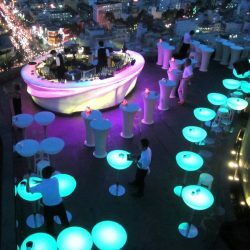 AMBIENCE: Décor, music, service and many other elements combine to create the ambience and atmosphere of a rooftop bar. It mystifies me when a bar has considered everything – from the minutest details of interior design to drinks’ presentation – and ruins it by playing sentimental Celine Dion and Westlife ballads. 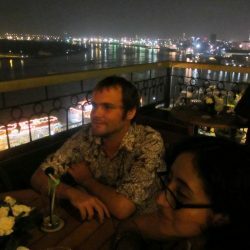 Vietnam gets a lot of stick (unfairly, in my opinion) from expats and tourists alike for the quality of its service. However, these bars are – by Vietnamese standards – expensive and exclusive, and my expectations and standards rise accordingly. Surly, brusque service is just as bad as overly attentive staff who watch your every move. 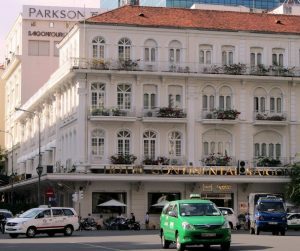 The Grand is a colonial-era hotel that opened in 1930. 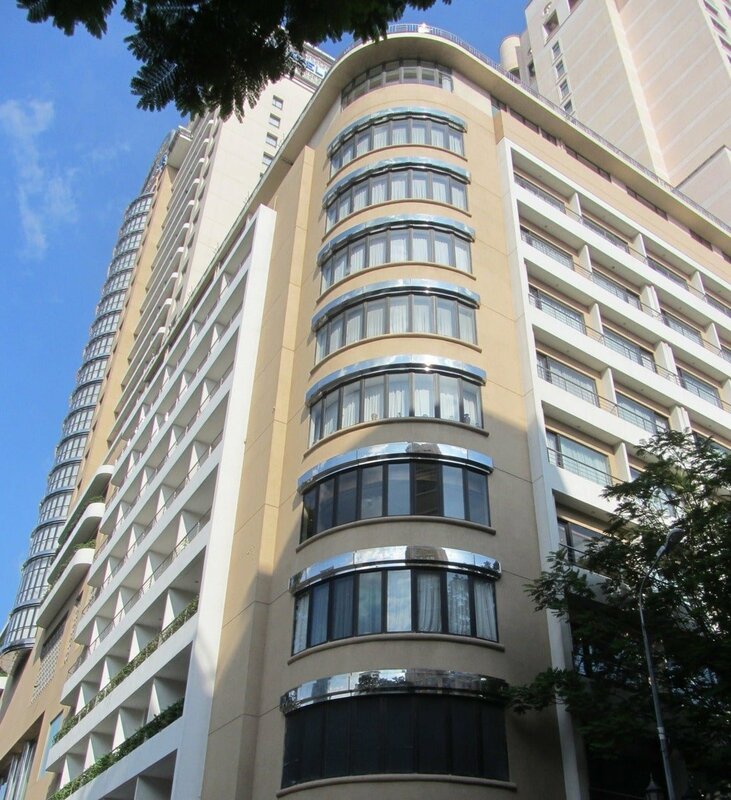 The original wing is an attractive building on Đồng Khởi Street. Formally the Rue Catinat, this is the street where novelist Graham Greene lived for a time during his long stays in Vietnam in the early 1950s. The Grand just about manages to retain an air of the past. However, modern hotels jostle for space on this central, boutique-studded street, and last year the Grand opened a new wing: a 20 storey building that soars above the original. At street level, the new wing makes an effort to keep up the colonial ambience, but in general it’s indistinguishable from any other modern hotel. What the new wing does offer is a great rooftop bar! The view is what gets the rooftop bar at The Grand into my Top 5. Very few places in Saigon have city and river views: The Grand offers a 360˚ panorama (or 3,600˚ as their website informs you!). To the West, planes take-off and land from Tân Sơn Nhất International Airport; East, tankers unload in the docks; South, new tower blocks rise up from downtown; and North, the Saigon River winds away towards the quiet, wealthy suburb of An Phú. 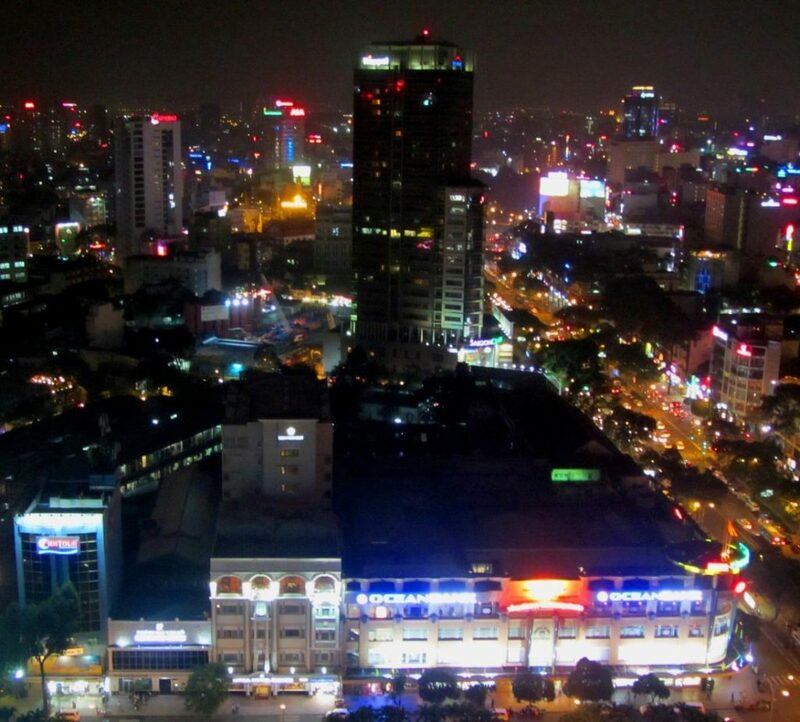 The Grand rooftop gives you a real sense of the topography of Saigon. Happy hour at The Grand is buy-one, get-one-free on all cocktails. 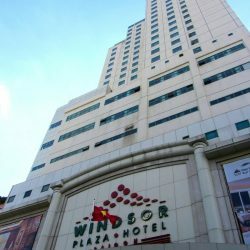 This sounds like a good deal, but it only runs from 3pm to 6pm, when the weather is normally too hot to comfortably sit outside and enjoy the views, and it’s a good half an hour before the sun sets over Saigon. What’s more, you are not allowed to change to a different cocktail for your free one. Drinks are reasonably strong and there’s a long list of cocktails, including all the classics and plenty of The Grand’s own inventions too. 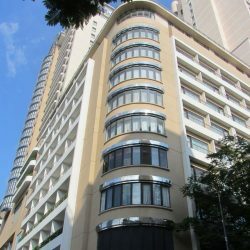 As The Grand is run by state-owned Saigon Tourist (see Ambience) I had lowered my expectations for the quality of drinks here, but I admit to being pleasantly surprised. 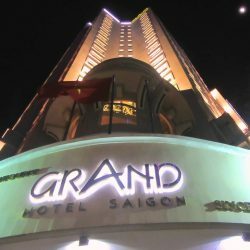 As mentioned, The Grand is part of the Saigon Tourist empire. In general, this is a sign of mid-range quality at high-end prices, and ambivalent service. The bar is inside, but seating is outside on a wooden deck. Tables and chairs are comfy. Service is fine. The deck is very breezy thanks to its exposure on all sides – a breeze in Saigon is always a relief and really adds to the feeling of being ‘above’ the city. 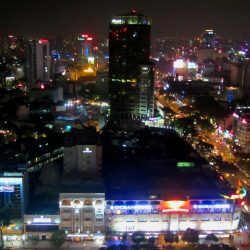 Bad pop music – another mark of Saigon Tourist – is played through speakers on the deck. 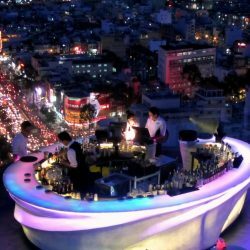 Balustrades around the perimeter of the bar are just at the wrong height and interfere with the view when seated – amazingly, this is a mistake that many of the rooftop bars make. 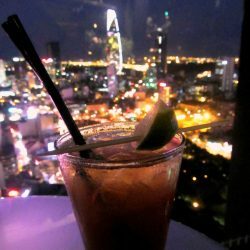 The experience is – as always with Saigon Tourist – no more than satisfactory, but the view and the breeze pull this rooftop bar above the general Saigon Tourist standard. 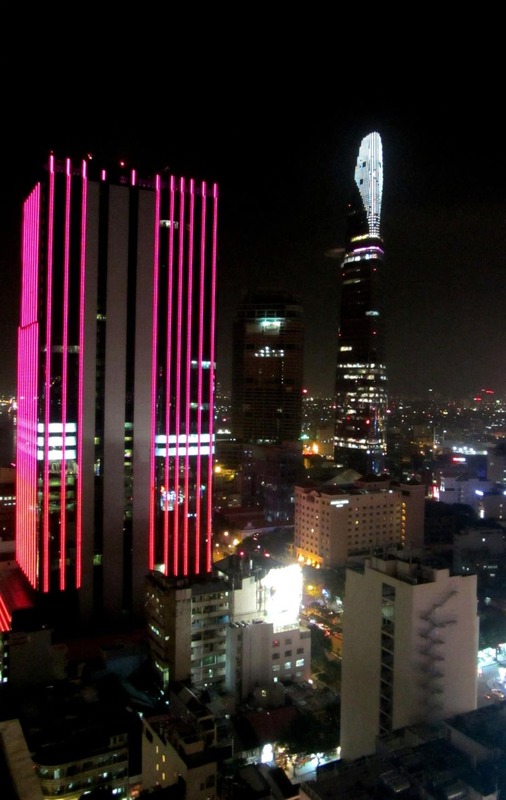 The pink twin towers of the Saigon Sheraton used to be one of the defining features of the city skyline. 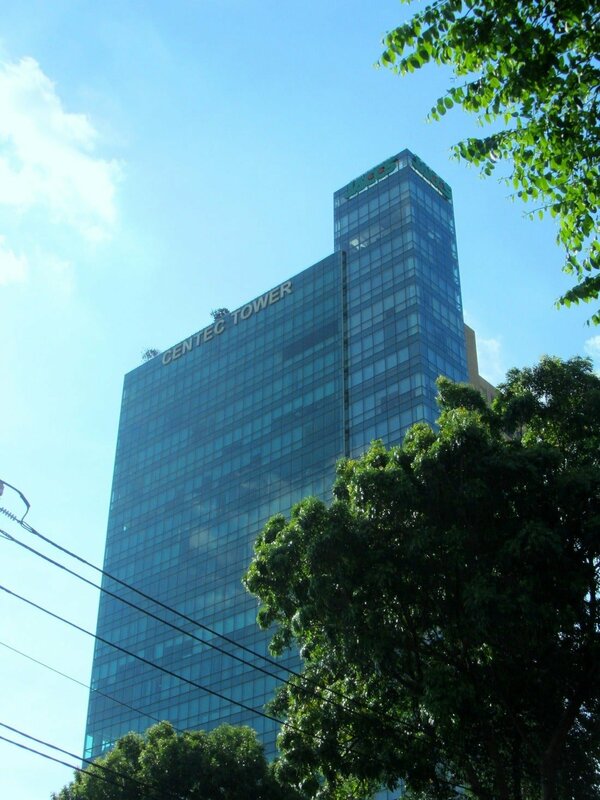 Nowadays, newer, taller, sleeker towers have grown up around it, but there’s still an air of exclusivity about this hotel. 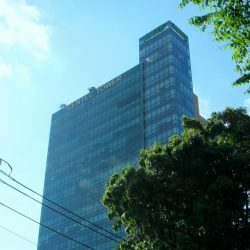 There’s always a buzz of expensive cars, clothes and cologne in the lobby and porte-cochère, as you make your way past the concierge to the large wood and marble elevators, and up to the 23rd floor. 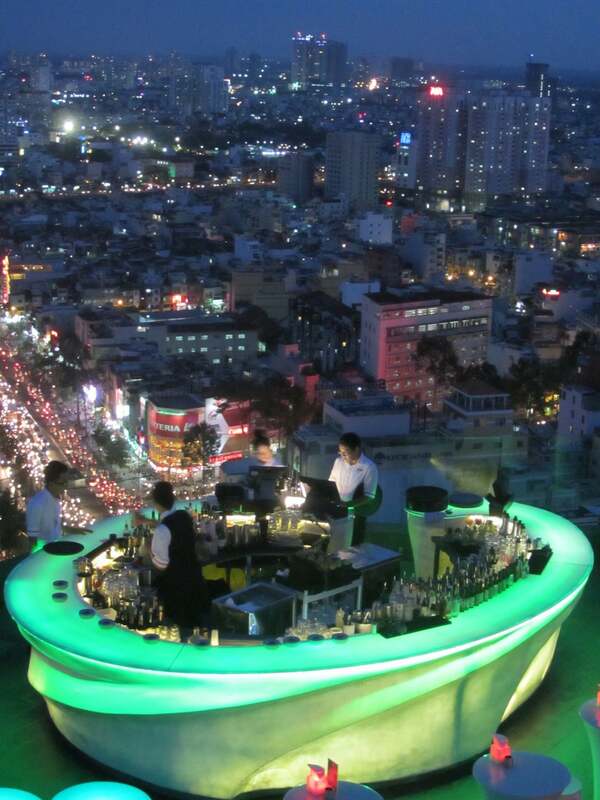 The Level 23 Wine Bar is one of the highest rooftop bars in Saigon. It’s not an intimate view but it’s big! The sheer height and scale is impressive. 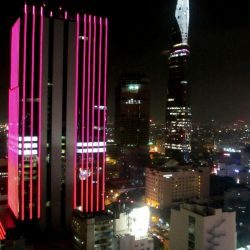 It takes in all the downtown sights, both old and new: colonial architecture like the Hôtel de Ville (now the People’s Committee), and modern skyscrapers like Bitexco Financial Tower (known as the Lotus Building), the second highest structure in Vietnam. 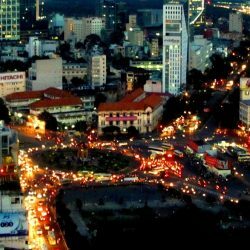 Being so high up, you get an almost bird’s-eye view of the seemingly organic struggle for survival among buildings in central Saigon: the low-rise and expansive buildings of the past battle for space with the new and slender architecture of the present. It’s a commanding view, but it’s only 180˚ and you might even have trouble seeing it! (See Ambience for details). Happy hour at the Sheraton is its biggest strength: buy-one, get-one-free on all cocktails and shooters between 4:30 and 6:30pm, seven days a week, and you have the choice to change to a different drink for your free one! 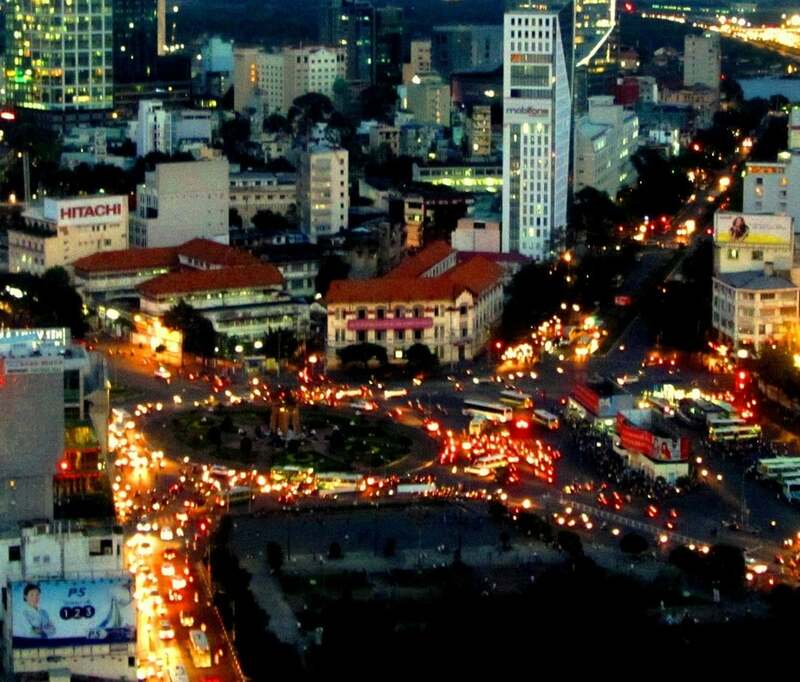 The timing is perfect for the cooler air during dusk, and to see the twilight colours over Saigon. I was once refused my free drink because – by the time I’d finished my first – it was already past 6:30pm! So, don’t wait too long to order your second drink! 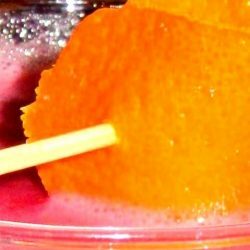 Although the choice is limited when compared to the extensive menus of its competitors, the cocktails here are strong and long. One round (with the second drink free) is more than enough to make all the twinkling lights of the city seem a little blurry. 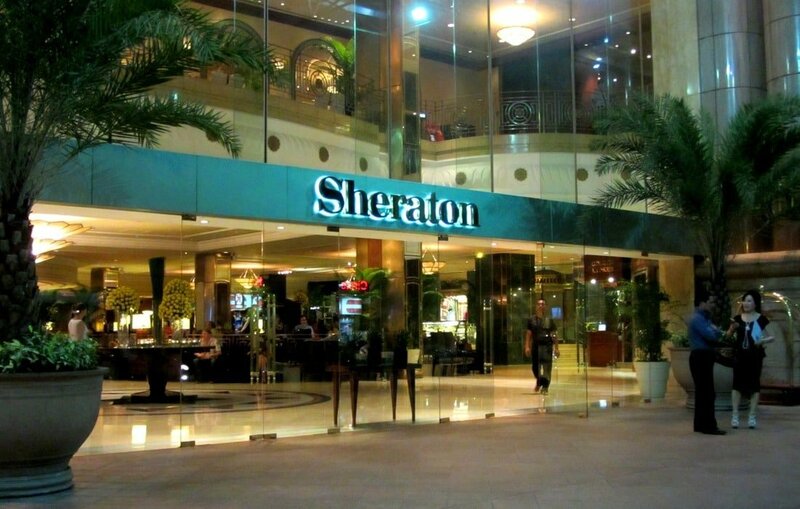 I admit to enjoying the kind of bland luxury that smart international hotel chains like the Sheraton offer, but it doesn’t lend much to the Level 23 Wine Bar. The bar is smart, airy – thanks to very high ceilings – and clean. It’s pleasant enough, but a bit, well, bland. The bar and seating area are actually inside, but the windows are very big and there’s no glass between you and the view. There are lots of green potted plants that create a ‘tropical’ atmosphere. A big mistake, however, is the seating. The seats that everyone wants to get are the high stools and tables right next to the windows – there are less than 10 of these. If those seats are taken, then you’ll have to make do with the low chairs, from where you can only glimpse the tops of the taller buildings. Even if you do secure a window seat, the view is still annoyingly obstructed by the railings, which some genius designed so that they are exactly at eye level when seated. I often see customers raising themselves out of their stools to see over the railings! Another drawback is (Grrrr!) the music. Although at a more agreeable volume than most bars, the choice is not to everyone’s (at least my own) taste: at my last visit they were playing a lumbering cover version of ‘Dancing Queen’ (the original would have been bad enough!). Service is very good, if a bit brisk on occasions. 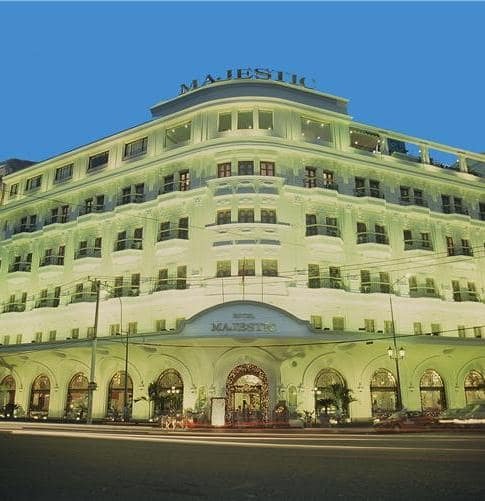 The Majestic is one of the grand old colonial hotels from the days when the French ruled in Indochina. 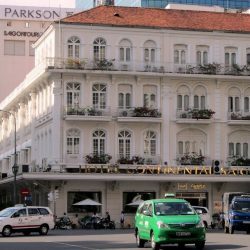 Built in 1925, today it seems a strange location for a luxury hotel: on the busy, noisy riverside road, at the wrong end of Đồng Khởi Street; away from the central crossroads near the opera house where the modern luxury hotels – like the Sheraton and Hyatt – are located. 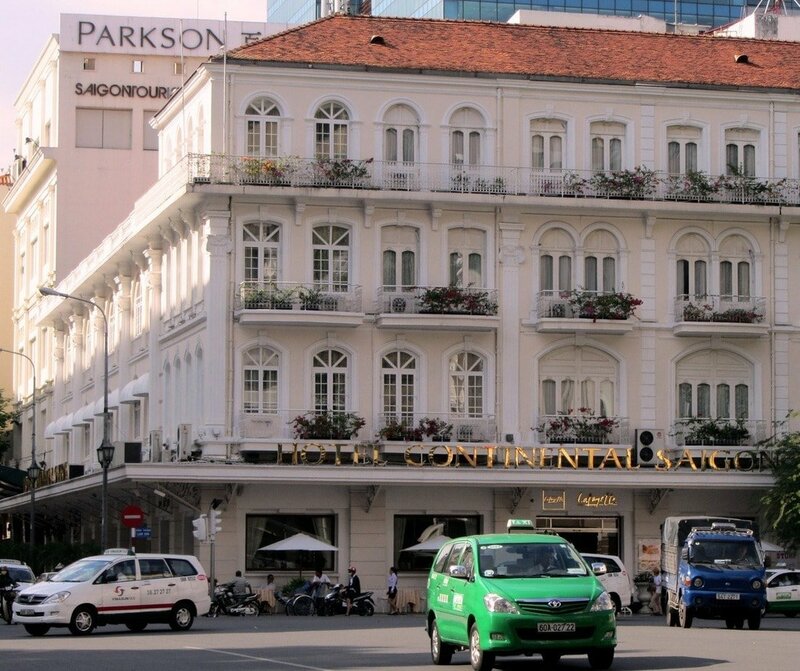 But, during the first half of the 20thcentury this is where the action was: in those days most people arrived in Saigon by ship; as they approached the pier the Majestic Hotel would have been one of the first buildings they saw. The Breeze Sky Bar on the 5th floor is where I had my first rooftop cocktail in Saigon, in 2005. 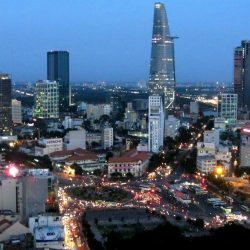 I was looking for a place that would satisfy my romantic notions of ‘old Saigon’, much of which came from Graham Greene’s novel, ‘The Quiet American’. 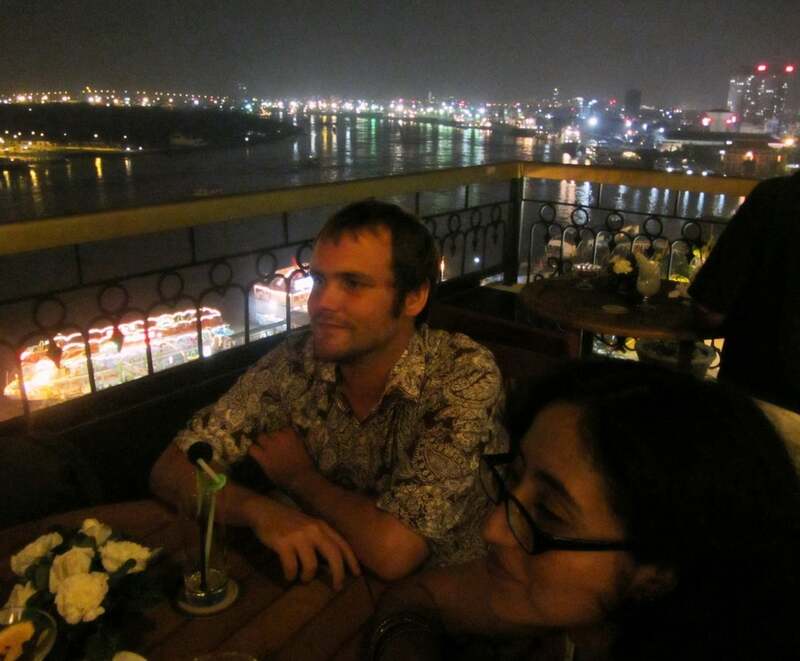 The view from the Majestic is all about the Saigon River. 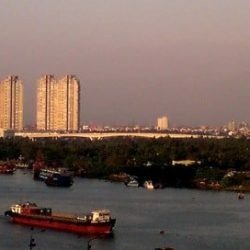 Unlike other big cities built on a waterway, such as London which spreads either side of the Thames, Saigon has yet to develop the land to the east of its river. At night, in particular, this creates a strange effect: west of the river is an urban zone of 8 million people, full of glowing lights and traffic; east of the river is a dark, empty, rural area of tropical foliage. However, the recently opened East-West Highway now cuts straight through this green belt, and over the next 10 years construction will turn the area into what is being billed as the ‘Second Manhattan’. While I wouldn’t describe the view from the Majestic as ‘pretty’, it is everything I ever wanted a tropical Asian docks to look like: rusting tankers ploughing through the thick brown river, battered palm trees leaning over the water’s edge, billowing black clouds threatening to break the humidity with an electrical storm, and the occasional sound of a ship’s horn as it pulls away from the pier, bound for some other exotic port I’ve never been to. 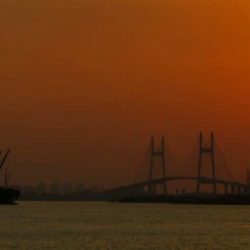 I used to spend hours gazing at this scene. For all the romance associated with Graham Greene enjoying cocktails here in the 1950s, and Thomas Fowler – the cynical English journalist reporting the Franco-Vietminh War for the Times newspaper, in Greene’s novel ‘The Quiet American’ – daydreaming about happy hour at the Majestic while stuck in a dangerous rural province west of Saigon; the Majestic today has no happy hour for non-guests! The drinks here are not as bad as they used to be. Prices have gone up, and the absence of a happy hour makes it expensive, but drinks are quite strong and there are lots of signature cocktails, whose names try to capture the romance associated with the hotel, like ‘Majestic By Night’. 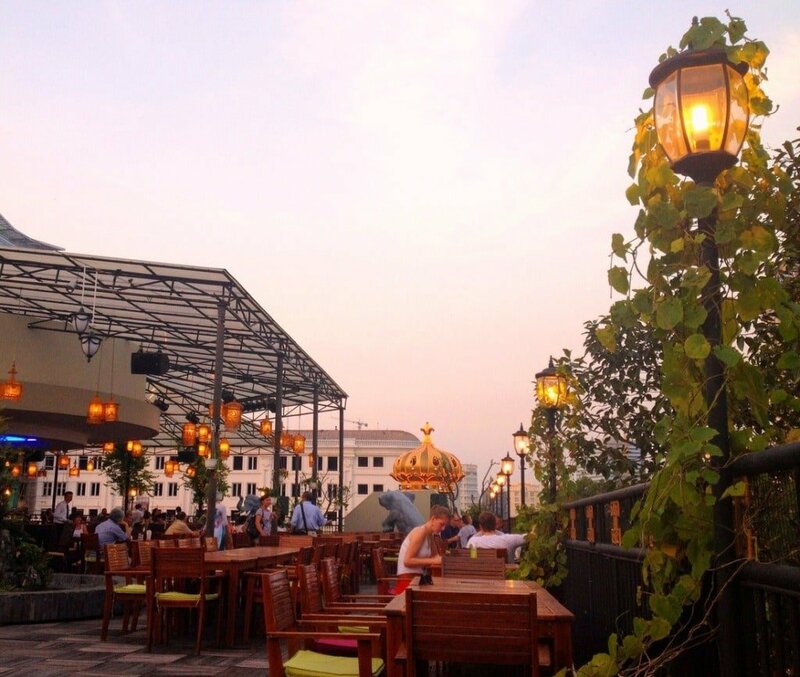 Some of the historic rooftop bars in Saigon, like the Rex and the Caravelle, claim to retain an air of the past, but the Majestic is the only one that really does – although Saigon Tourist is doing its best to erase it in some cases. 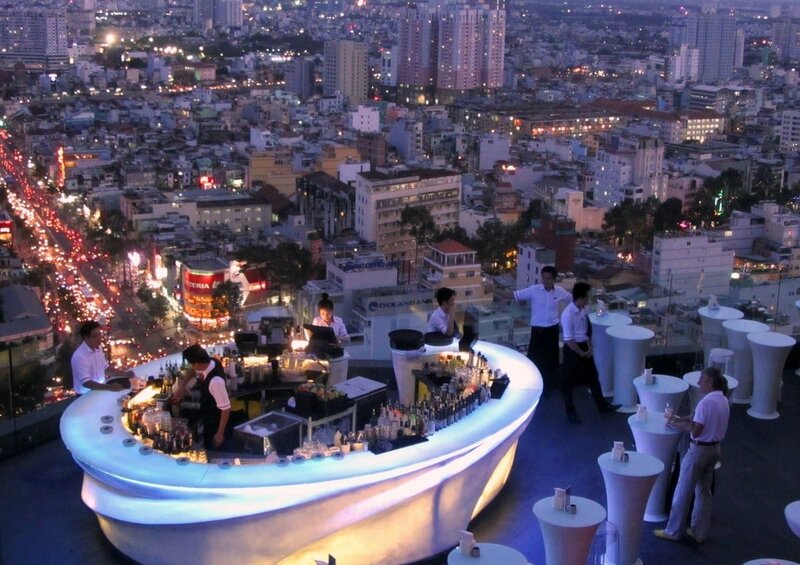 The Breeze Sky Bar is on the 5th floor, which makes it the lowest of all the rooftops in this Top 5; (don’t make the mistake of going to the M Bar, which is on the 8thfloor – although this is also a decent bar with a good view). 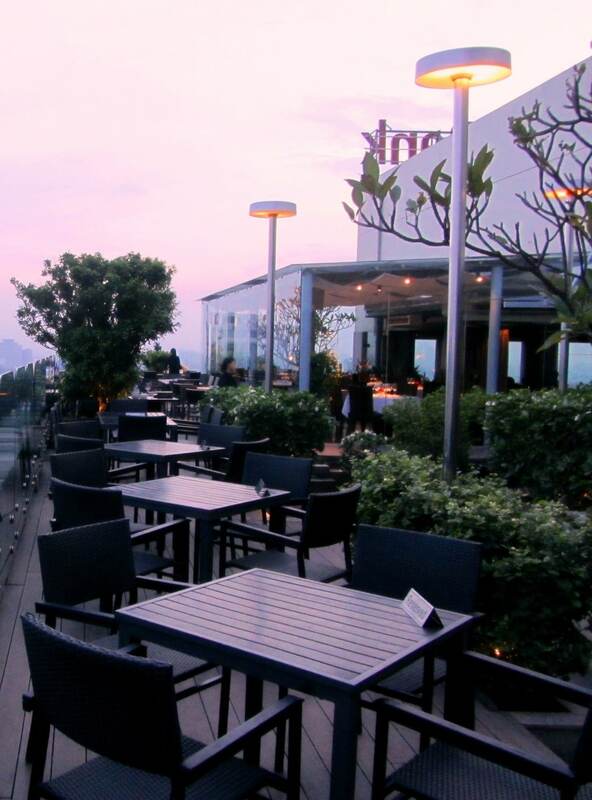 Because the Breeze Sky Bar faces the river, it receives a cooling breeze (hence the name). The seating area is spacious and multi-leveled. Wooden tables and chairs resembling garden furniture are tasteful enough. There’s indoor and outdoor seating – the former is great for watching storms in the rainy season while staying nice and dry. The best seats are right up at the top: find the stairs that lead to a small mezzanine patio and then go up another flight until there are no stairs left to climb. Up here it’s quiet and private, (most people can’t be bothered to climb the stairs, and the rubbish Muzak from the bar is barely audible). The actual bar is classic Art Deco with lots of wood, marble and coloured glass panels. Service has always been a little shaky here – staff are either overly attentive or non-existent. Unfortunately, the bar doubles as a buffet at most mealtimes, which lowers the tone a bit. 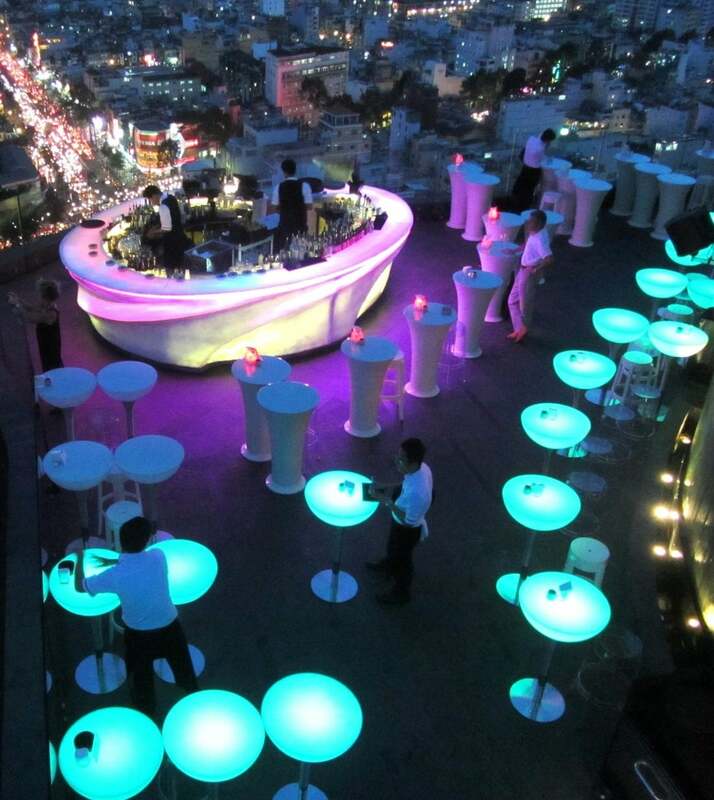 Chill Sky Bar only opened a year ago, but it has quickly become one of the hippest places in Saigon for people to flash their cash. 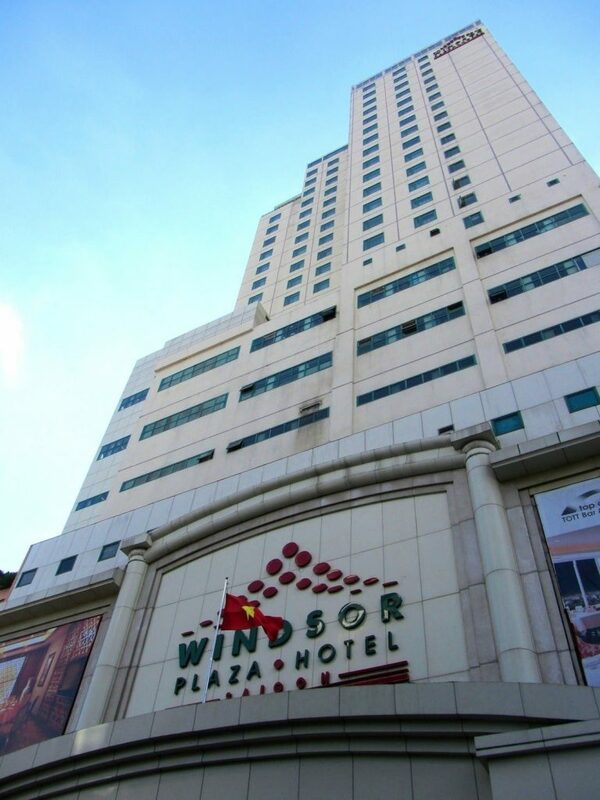 Located on the top floor of the AB Tower, it sits on a busy corner between the backpacker area of Phạm Ngũ Lão and the tourist mecca of Bến Thành Market. It’s the newest bar in the Top 5, and the only one that has a dress code: no shorts and no ‘slippers’ (presumably ‘flip-flops’) – in other words: ‘no scruffy backpackers!’ Despite sounding a bit snooty, the bar is very welcoming. 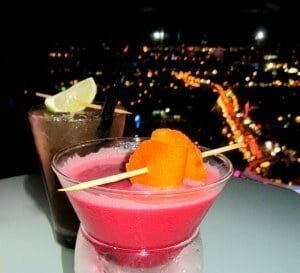 The drinks, view, and general appearance are great – well-worth changing out of your sandals and into your shoes for. 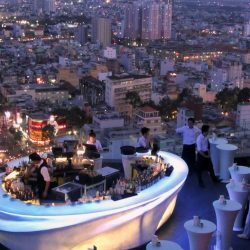 Chill Sky Bar offers a different perspective of the city than the previous three bars, all of which are around Đồng Khởi Street. On top of AB Tower you look back towards the big hotels and office blocks of Saigon’s financial district: it’s a great cross section of all the big construction projects that have changed the city skyline over the last ten years. 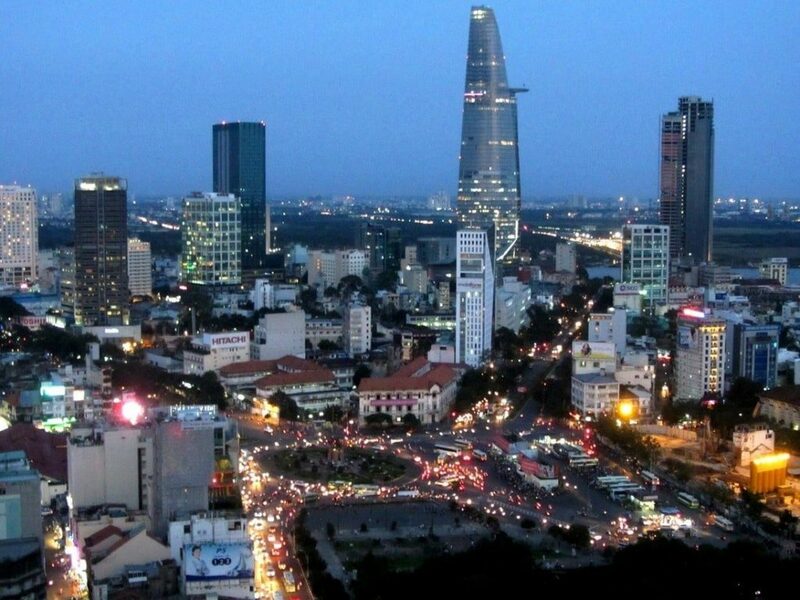 The best part of the view is Bến Thành traffic circle, which is nicely aligned with the rocket-like Lotus Building (Vietnam’s second tallest structure). At rush hour, the traffic circle is a mesmerizing carousel of red tail-lights and white headlights, spinning around in what appears to be a vortex that pulls all traffic towards it, then spits each vehicle out at random back into the streets. 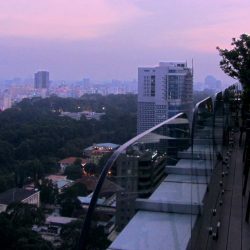 Another good view is the bar itself: a colour-changing ellipse set on a platform right next to the edge, so that it appears to hover over the city. 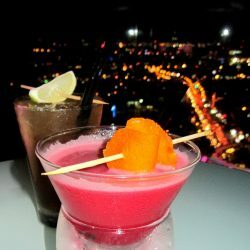 Chill Sky Bar has half price cocktails, beer and finger food on weekdays from 5:30 to 8pm. The timing is good, and the quality of food and drink make it decent value for money. Get here early for a seat with a view, and to witness the hypnotic ebb and flow of Saigon’s rush hour. Drinks are very good, strong and particularly tasty here. 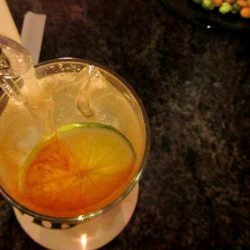 The menu is short because it only lists their signature cocktails – bar staff assume you are familiar enough with the classics to have committed them to memory; just ask for whatever cocktail you want and they’ll make it for you. 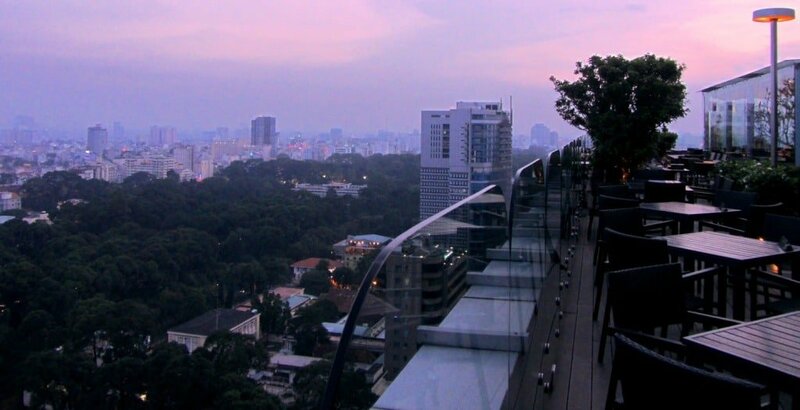 Chill Sky Bar treads the line between exclusivity and openness quite well. The futuristic elliptical bar, low lighting and dress code at first made me feel as though I was crashing someone else’s lifestyle; but staff are very welcoming and well-trained, and it doesn’t take long to settle down and feel comfortable. However, because it’s so popular, private parties often book the majority of bar space. You might find yourself limited to a small section, or even turned away if the whole place is booked. Call ahead to check. Inside, the décor is all cushions and coziness, but outside (which is the place to be) it’s minimalistic, slender and sleek: high tables with luminous tops appear to grow up from the floor like some kind of extraterrestrial plant. Unfortunately, the stools are rather uncomfortable and, of course, they couldn’t resist the music – a trendier genre this time, but it still seems unnecessary to have any music at all when there’s an incredible view to entertain you. Note: pregnant women are not allowed outside on the deck. 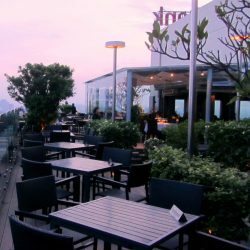 Shri is a smart but unpretentious, modern and comfortable bar on a breezy open-air deck at the top of Centec Tower, in District 1. It’s a leafy rooftop set a little behind the downtown area. 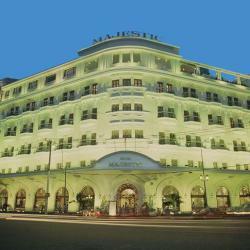 Shri only opened two years ago, but there’s an established air about it, which reminds me of the colonial hotels. Unlike Chill Sky Bar, this is a place where you feel you can linger. 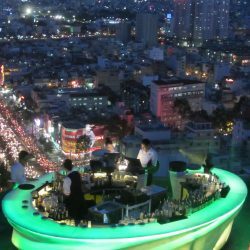 If it wasn’t for one big but remediable drawback (see Happy Hour) Shri would be my outright Number 1 Rooftop Bar in Saigon. As it is, Shri ties with Chill Sky Bar. Views to the south and east of the city take in all the famous buildings of the past and present – Reunification Palace, Notre Dame Cathedral, Kumho Plaza, the Lotus Building – all the way out to Phú Mỹ suspension bridge over the Saigon River. It’s also directly above Reunification Park, which is a nice green space full of big tropical trees. As with Chill Sky Bar, the glass railings don’t obstruct the view, so you can enjoy it even when seated. There isn’t one! Why?? The reason I was given is that Shri is primarily a restaurant, not a bar. 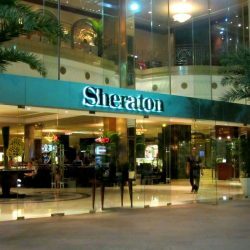 But surely if they introduced a happy hour between 5 and 7pm, they could easily compete with the likes of the Sheraton and Chill Sky Bar. After all, most customers who come to dine wouldn’t do so until 7pm anyway, and some customers who come for happy hour might stay for dinner too! A happy hour might also help to raise the profile of Shri – most of my friends had never heard of it. Drinks are as strong – but not as nicely presented – as Chill Sky Bar. 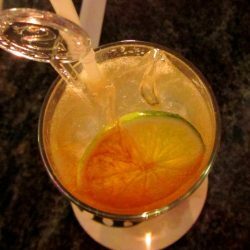 There’s a lot of choice, and some interesting infusions, such as lemongrass. Outside on the wooden deck, tables and chairs are arranged around frangipani and coral trees; both have gorgeous, scented flowers that perfume the air. There are small hedges and low street lamps, all of which suggests you are at ground level, until you glimpse the city sprawling below. It’s an intimate spot, and there was even birdsong (rare in Saigon) when I was there. Décor is comfortable and unfussy. Inside, everything is plusher and very dark. Many of the tables are reserved for dinner guests from 7pm, so try to get here early, and you should be able to negotiate sitting at one of the reserved tables until the guests arrive: staff are friendly and helpful. Strangely, I don’t recall any music (which is reason enough to make this bar Number 1), but I might be mistaken; all I remember is birdsong. 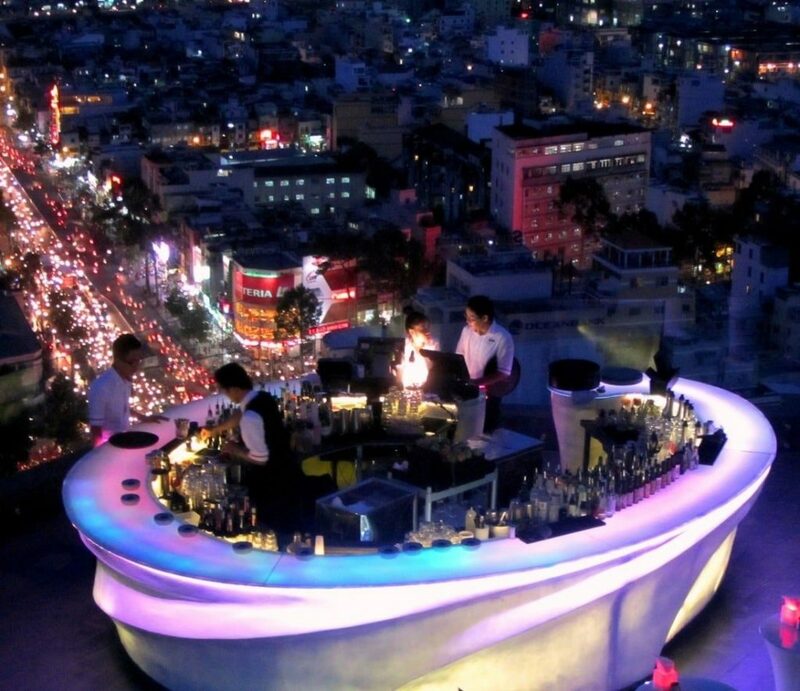 This bar is superbly positioned at a main crossroads in central Saigon. 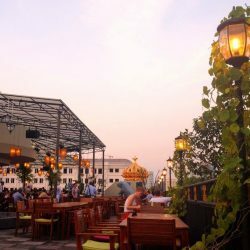 During the 1960s and 1970s the Rex Rooftop Garden Bar was one of the favourite hangouts for media workers and military personnel, who gathered here to drink and talk during the war years, (although back then it was not a hotel). But, in my opinion its reputation today survives purely because of its ‘romantic’ associations with the Vietnam War. Service is not great, décor is caught between kitsch and classy, drinks are not high quality, and the view is difficult to see from some of the seats. It does, however, have a very long happy hour: 5 to10pm, 7 days a week. But, with drinks only discounted 15%, this is not enough to lure me back. Another overrated rooftop bar with wartime associations, the Saigon Saigon Bar at the Caravelle is famous as the place where you could ‘watch the war’ as it carried on over the river, while you sat safely sipping cocktails. The view and cocktails are great, but I personally can’t warm to the bar. Like the Rex, the décor feels confused; is it swanky? or is it colonial? This is supposedly a bar with history, but I don’t get a sense of the past here. 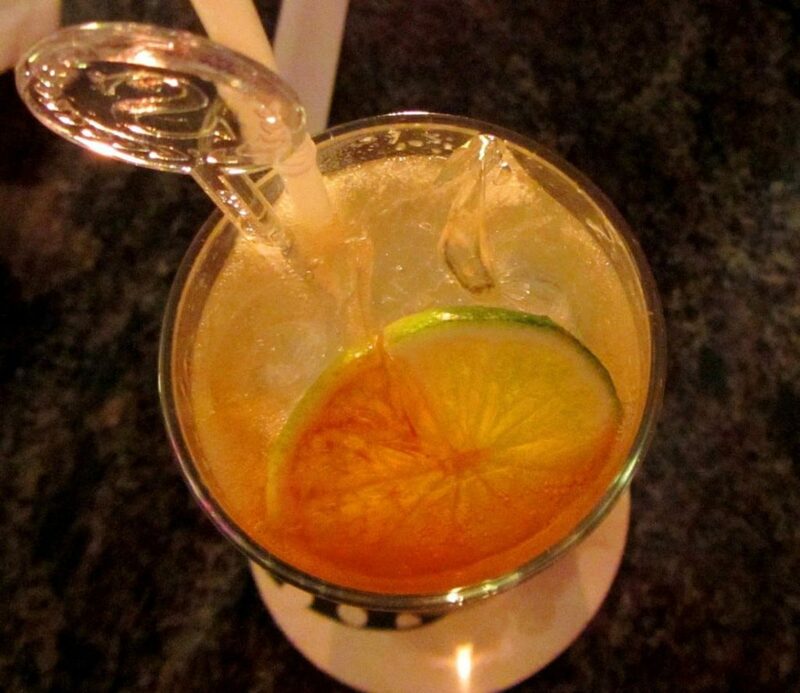 There’s a great happy hour: buy-one, get-one-free, 7 days a week, 4 to 9pm! The Continental doesn’t have a rooftop bar; but it should. It’s an attractive colonial building in a great location directly opposite the opera house. There’s plenty of genuine historic charm – much more so than the nearby Rex and Caravelle hotels – and it is where Fowler (the English journalist in Graham Greene’s ‘The Quiet American’) took his tea. I wish that the owners (Saigon Tourist, again!) would convert the little rooftop patio – and perhaps the corner bedroom on the top floor too – into a bar. Done properly it would stand above the competition in this area. Alas, for the time being, there is only the downstairs café, the courtyard restaurant (lots of charm here) or the first floor Starry Night Bar – an awful name for an awful bar. 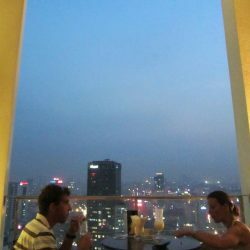 In District 5, on the cusp of China Town, this bar has good 360˚ views, but they are badly obscured by railings and walls. You’re better off taking a window seat inside at the restaurant than outside at the bar. Drinks are O.K and happy hour (5 to 7pm, 7 days a week) is buy-one, get-one-free on a long list of different cocktails and beers. Terrible music – both live and recorded – make it unpleasant to be too near the bar: I usually move my table and chairs out onto the patio, away from the music, where I can enjoy the views in peace. The Lotus Building (as it is commonly referred to) had a short spell as Vietnam’s tallest skyscraper from 2010 to 2011. 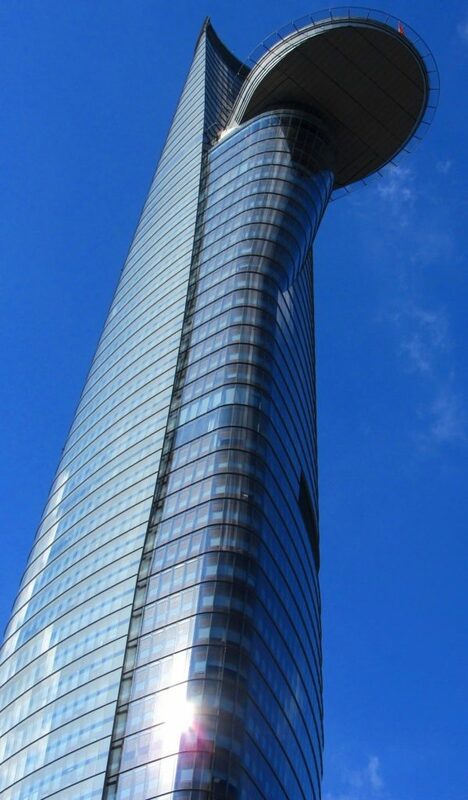 It’s a sleek and slender glass tower that defines the city skyline. It was designed to resemble a lotus bud with its delicate overlapping layers. I think it looks great (from the right angle!). 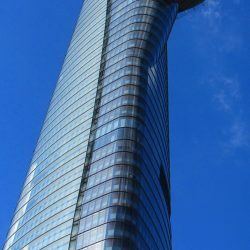 For a pricey $10 you can get to the observation deck on the 49th floor, but it’s a better idea to spend the same money on a cocktail at the newly opened Alto Helipad Bar on the 52nd floor. The bar is so-named because of the huge helicopter landing pad that sticks out of the Lotus Building on this floor. Apparently, VIP guests will arrive at the bar directly by helicopter! There’s a happy hour from 5 to 8:30pm, when selected drinks are discounted by about 20%. 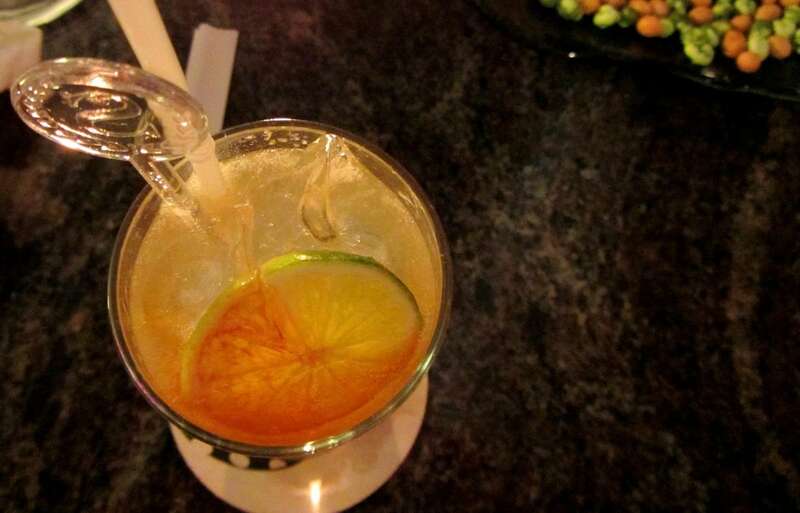 The average price of a drink is 150,000VNĐ ($7). The views are panoramic and spectacular.